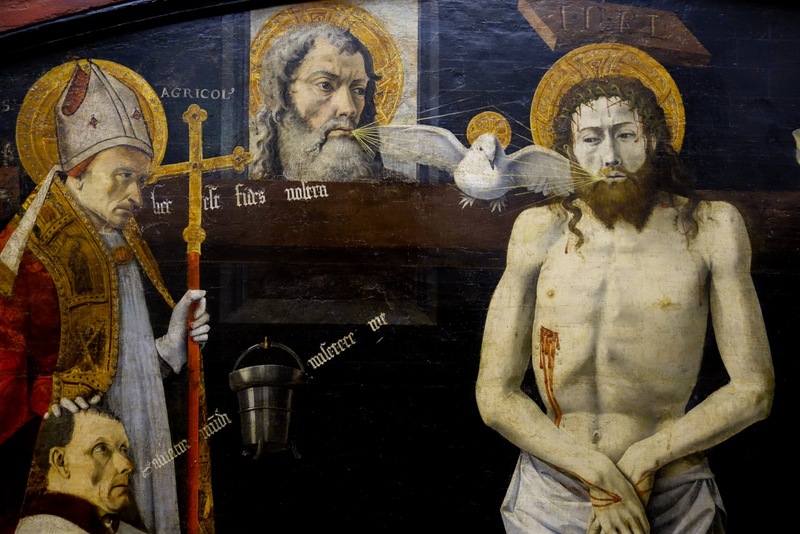 The Trinity is hard to visualize, as this late Gothic painting from the Louvre demonstrates. I’ve heard a lot of clergy say they hate to preach on Trinity Sunday. It seems too abstract, too complex, too heady a topic for a Sunday congregation, especially in a culture where thinking theologically is not a widely practiced art. It’s like trying to explain quantum physics to non-scientists. It took centuries for the ancient church to shape the doctrine of the Trinity. How can anyone explain it in 15 minutes? Besides, people look to the preacher for inspiration, not explanation. They want a sermon to make sense of things, not to make their heads explode. I actually enjoy preaching the Trinity. I like it so well I even preached when Trinity Sunday fell on the day between my wedding and my honeymoon. It’s an inexhaustible subject – the Christian theory of everything – but over my next three posts, let me (humbly) suggest three things which I believe to be foundational for trinitarian faith. We tend to think of a person as defined by his or her separateness. I’m me and you’re you! We may interact and even form deep connections, but my identity does not depend upon you. I am a self-contained unit. You can’t live in my skin and I can’t live in yours. That’s the cultural assumption, which goes back at least as far as Descartes in the seventeenth century, and continues today in such debased forms as rampant consumerism, where my needs and my desires take precedence over any wider sense of interdependence, community, or ecology. But what we say about the Persons of the Trinity is quite different. Each Person is not an individual, separate subject who perceives the other Persons as objects. The Trinitarian persons experience one another not from the outside, but from the inside. They indwell each other in a mutual interiority. John Lennon expressed the Trinitarian spirit when he sang, “I am he as you are she as you are me and we are all together.” And a French mystic put it this way: “it’s a case of un ‘je’ sans moi” (an “I” without a me). But if the divine Persons are all inside each other, commingled, “of one being,” as the Creed says, what makes each Person distinct? To put it succinctly: the Persons are distinct because they are in relation with one another. As Martin Buber observed, we are persons because we can say “Thou” to someone else. To be a person is to experience the difference – and the connection – that forms the space between two separate subjects. My consciousness is not alone in the universe. There are other centers of consciousness: Thou, I… Thou, I… The fact that you are not I is what creates self-consciousness, the awareness of my own difference from what is outside myself. If we apply this to the Trinity, we say that there are Three Persons because there is relation within God, relation between the Source who begets, the Word who is begotten, and the Spirit who binds the two together and moves them outward in ever widening circles. These relations are not occasional or accidental. They are eternal. There is an eternal sending within God, an eternal self-giving within God, an eternal exchange by which God is both Giver and Receiver simultaneously. Trinitarian faith describes a God who is not solitary and alone, a God who is not an object which we can stand apart from and observe. The Trinity is an event of relationships: not three separate entities in isolation and independence from one another, but a union of subjects who are eternally interweaving and interpenetrating. The early Church had a word for this: perechoresis. It means that each Person penetrates the others, each contains the other, and is contained by them. Each fills the space of the other, each is the subject, not the object of each other. As Jesus says in the Fourth Gospel: I am in the Father and the Father is in me. This divine relationality is not something which an originally solitary God decided to take up at some point. God is eternally relational. Before there was an external creation to relate to, God’s own essential self was and is an event of perpetual relation. There was never simply being, but always being-with, being-for, being-in. To be and to be in relation are eternally identical. In other words, God is Love giving itself away – self-emptying, self-diffusing, self-surrendering – and in so doing finds itself, receives itself, becomes itself. For those of us made in God’s image, who God is matters deeply, both for our own self-understanding and for our engagement with the world. The Trinity isn’t just a doctrine or an idea. It’s a practice, a way of life, the shape of every story. This entry was posted in Anglican spirituality, Episcopal Church, Liturgical Year, Theology and tagged Elizabeth Johnson "She Who Is", God in three persons, God is love, Gregory of Nyssa on the Trinity, I John 4:16, John D. Zizioulas "Being As Communion", made in the image of God, Martin Buber "I and Thou", Perechoresis, Preaching the Trinity, The Holy Trinity, The relationality of God, Trinitarian theology, Trinity Sunday by jimfriedrich. Bookmark the permalink. Thanks, Mark. I look forward to hearing your homily.